How you can identify the format of files that have an unknown extension or don't even have an extension. Also find the associate program to open that file type. Extensions, or the characters that precede the last period in a file name, help you determine the type of a file (is it an image, a video or something else) and you immediately know which software program is required to preview that file. However, you may sometimes come across files that either have unknown extensions or don’t have any extension at all. How do you then determine the associated application that is required to open a file when you don’t recognize the file type itself? The first thing you are likely to do is “google” for the file extension but there is an easier open as well. Go to Wolfram Alpha and just search for the file extension with the dot (or period) – see example. 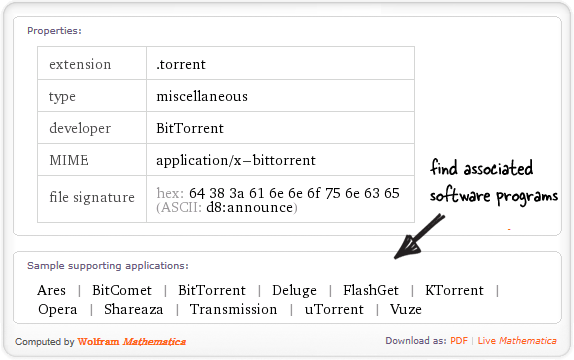 Wolfram won’t just reveal the technical details of that file extension – like the developer and MIME type – but also generates a list of software programs that you may use to open that file on your computer – see sample results. If a file doesn’t have an extension, you can still identify the format of that file from its signature. All known file types have a standard and unique signature (screenshot) and this data is stored in the file itself. There are programs that can read this signature* and determine the file format even if the extension is missing from the file name. The most popular program in the category of file identifiers is TrIDNet. First download and unzip the TrIDNet utility and the associated XML definition files in the same directory. Then open the TrIDNet.exe file, press the “Rescan Defs” button to load the file signatures (you only need to do this once) and then drag-drop any unknown files that you wish to analyze. It will show the different file types that match with the file’s signature and you can then use Wolfram Alpha again to learn about the different programs that can be used to open that particular file type. Do remember to rename the files after identification (press F2, prefix a dot with the extension). [*] You can also determine the file signature of any known file format using Wolfram itself – use the query “<extension> file signature” as in this example.